Surprisingly 5-digit United States ZIP Codes can and do cross county, state, and time zone boundaries. Even more interesting is that the preferred city name for a ZIP Code can vary at the 9-digit ZIP Code level. The United States ZIP Plus 4 Multi-County ZIP Code Database provides an efficient platform to accurately identify the preferred city name, county, or time zone for any 9-digit ZIP Code. 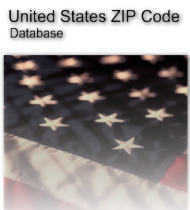 This database provides a lossless compression of the preferred city name, county and Plus 4 add-on range information from the 43 million+/- records of the United States Postal Service ZIP + 4 national database, appends time zone identification to each ZIP+4 range, resulting in a manageable 406K +/- record count. While this data finds use in many type applications, it is particularly well suited for TCPA and similar compliancy type applications needing to identify the county and time zone for any 9-digit ZIP Code. The 5-digit code that identifies a specific geographic delivery area. ZIP Codes can represent an area within a state, or a single building or company that has a very high mail volume. The beginning 4-digit ZIP Plus 4 number for the current "Plus 4" range. The ending 4-digit ZIP Plus 4 number for the current "Plus 4" range. Identifies the type of ZIP area a 5-digit ZIP Code serves. U - Unique ZIP code, ZIP assigned to a single organization. blank - Standard ZIP with many addresses assigned to it. The USPS preferred last line city, municipality or Post Office name for a ZIP Code. The USPS 2-character abbreviation for the name of the state, U.S. territory, or armed forces ZIP Code designation. The Federal Information Processing Series (FIPS) county code is a unique 5-digit code used to identify every county or equivalent area. This code is technically the concatenation of the FIPS 2-digit state code followed by the FIPS 3-digit county code. Single Y/N value indicating whether Daylight Saving Time (DST) is recognized for the geographic area identified by the ZIP Code. Unique time zone name from the Internet Assigned Numbers Authority (IANA) time zone database. This database is also known as the tz database, tzdata, and Olson database. The common name of the , parish, borough or equivalent area. USPS 2-character state, territory or equivalent abbreviation. Unique 2-digit Federal Information Processing Series (FIPS) state code. The formal state, territory or equivalent name.